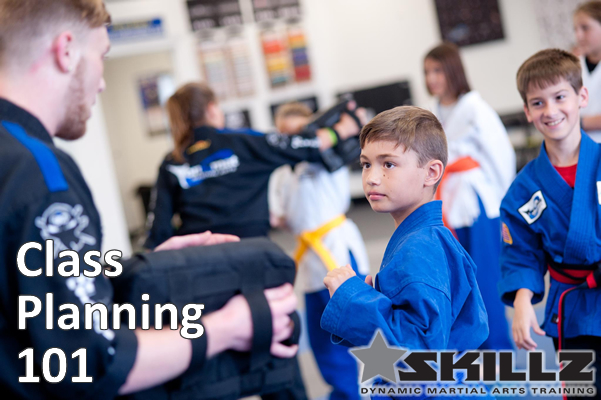 Teaching a Martial Arts class without planning is like heading cross-country without a map. You can do it, but chances are you are not always going to take the best route. Class planning is essential because it gives you a clear sense of what you are trying to accomplish and how you are going to accomplish it. At the same time, being prepared is the number one way to stay motivated as an instructor. Being prepared means planning not just what you teach, but how you are going to teach. Class planners can vary considerably based on an instructors style, experience, and personality. With that said, this report focuses not on the actual curriculum itself, but the process of effective planning. The emphasis is on getting you to reflect on the critical elements of effective teaching including setting classroom goals, planning to accomplish those goals effectively, and assessing what you have done to see if there is any room for improvement. Planning to Accomplish Your Goals Effectively. The first step is to see the big picture. Understanding how to set the right goals will provide you with direction and minimize time-wasting activities. This is considered the scientific part of your class planning because your main objective is to generate maximum results with your students based on the age range and experience levels of the class. What is the age group that I am working with? What do I want my students to learn today? Why is it important for them to learn it? It is important that you understand that students learn and grow in stages based on age. The wider the age range of the students in class, the more flexible you will need to be with your expectations for the class. This is where science trumps all other elements of class planning, therefore it is extremely important that you know what to expect, and what not to expect from your students based on age. Your older students will have many more skills than your younger students, and therefore will pick up on the curriculum much faster. Your younger students will need more time learning and may get frustrated and easily distracted if they cannot keep up. If you pace the lesson plan based on the older students in class, you need to expect some of your younger students to show signs of frustration, distraction, and irritability during challenging drills. If you pace the lesson plan based on the younger students in class, you need to expect some of your older students to show signs of boredom and lack of concentration during the less-challenging drills. Although it is best to break your classes down based on narrow age groups, if you are not in the position to do so, try and target the median age in class and then create a few variations of each drill for both your older and younger students. Not all areas of Martial Arts training are of equal importance. Therefore, when putting together your class planner, you need to think about what you want your students to walk away with at the end of class. Trying to cover too much is a far more common error than covering too little. Be selective and keep it simple. Resist the temptation to cram too much into a single class. It takes far more than 45-minutes to learn everything there is to know so there is no reason to believe that your students will pick it all up in one class. For students under the age of 10, select one skill, idea, or concept that you will cover in class. For students ages 10 and over, you can select two skills, ideas, or concepts. Technical speed: the quality of your moves when applied as quickly as possible such as kicking with proper chamber, execution, and re-chambers. Explosive speed: non-stop continuous movement such and multiple moving when sparring. Reactive speed: the rate at which you respond to your opponent such as blocking in sparring. It is important for you to understand exactly why you are teaching your topic for the day so that you can articulate your rationale in part 2 of your class planning. If you cannot find something compelling about the importance, significance, or utility of the material at hand, you can’t expect your students to see the relevance either. Having a clear rationale will help your approach to teaching the subject at hand, and at the same time will motivate student learning as well. Where does the material covered in this planner fit into each student’s testing requirements? For example with reference to speed as broken down in the previous section: Students must have speed in order to effectively spar with other opponents. What makes the material in this planner so important for the students to learn? 1)Technical speed is important for the students to learn because they can have good technique, but if they cannot execute their kicks quickly with good technique then they will miss their target often when sparring. 2)Explosive speed is important because students must be able to perform multiple moves quickly in order to increase their chances at hitting their target. 3)Reactive speed is important because students must be able to respond to their opponent’s actions quickly in order to limit getting hit. Can all of the students in class learn the material in this planner? For example with reference to speed as it applies to our 7 to 9 year old CORE SKILLZ program: Yes. Children this age are starting to grasp the concept of speed and can increase their speed during their drill training regardless of rank. Once you have a general map for what your goals are, you can begin to fill in the details on how you are going to get there. This is the artistic part of class planning. The precise combination of how you deliver the goals for the day, the drills you use, and the sequential order of the drills are guided by three important principals. Those three principals are: the curriculum in which you plan to teach, the amount of students in class, and the amount of assistants available to you*. However, it is important that you keep in mind that YOU are the primary audience for your planner, and not the students. You must personally find the planner capable of delivering your goals in an exciting manner, and in turn, your students will enjoy learning from your performance. Putting together a highly motivating mat chat. Selecting the very best drills to accomplish your goals. The order in which you will run your drills. *Please note: if your students and instructor team are not assigned to specific classes, then your class planning is going to be much more challenging because you will struggle to keep balance in the overall presentation of each drill. Once you choose the material for your class you must know how to present your goals with your students in a manner that get’s them excited to learn. This is done during your mat chat, which should be given after your daily warn-ups and before you jump into your drills. Your mat chat should be short, but at the same time effective. It will set the mood and tone of the class, so make sure that you put a lot of attention into what you say and how you say it. Tell the students what the skill, idea, or concept is that you will cover today. Ask one to tell you in their own words why they think the skill is important. Explain in your own words why the material is important and how they will train to accomplish the goals for the day. There are many exciting possibilities when designing the best drills to help you accomplish your classroom goals. Depending on your personality and experience, your drills may be seriously intense or extremely entertaining. Instructors in certain disciplines often lean more heavily toward one end of the continuum or the other. The question of which drills to use, however, is actually less an issue of the style of Martial Arts you teach, but more so on if your presentation of the drills make you likeable, influential, and at the same time excited to teach day-after-day, week-after-week, month-after-month, and year-after-year – in each particular class. A good rule of thumb is to select drills that you know your students are going to enjoy based on your ability to teach them. If you select a drill that you do not enjoy teaching, then your students will ultimately not enjoy learning. At the same time, become aware of the most successful drills based on the curriculum, class size, and the amount of assistants you have. Create at least one new drill per class. Although repetition is important, it is equally important to keep things fresh. This is where creativity comes into play. You can easily create a new drill by doing a little bit of research on the Internet, watching students practice in other sports, , visiting other successful Martial Arts schools, attending teaching seminars, or investing in done-for-you drills platforms like SKILLZ (shameless plug!). Make sure that your drills are appropriate for your class size and the amount of assistants available. Avoid running drills with long lines when you have a shortage of instructors. Also avoid running drills that require 1-on-1 instruction if you have too many students and not enough instructors. Make sure your drills are time-appropriate for your class. Avoid running drills that take up a majority of the class time. Make sure that your drills will generate measureable results. Avoid running time-wasting drills that really have no substantial value to the overall goal of the class. You will find that the order in which you run your drills does have an impact on the overall success of the planner. By rule of thumb, you should work your way from the least challenging drill up to the most challenging drill. If you follow this order, the students will show more improvement because their confidence will grow as they tackle the easier drills and work their way up to the harder ones. Also remember to always end class with something fun and social so that your students leave excited and eager to return. Do the drills build off each other? Do the drills feel like a roller coaster ride, or do they transition from one to the next smoothly? Does the class end with excitement, or does the energy level fizzle out? The last part of effective class planning is gauging the overall success of the class. All too often instructors do not discover if the students were actually learning the curriculum successfully until their next belt exam. This is the intellectual part of class planning, because once you are capable of identifying the strengths and weaknesses of your class planners, you are on your way to becoming an expert. In many cases, you will run back-to-back classes, therefore you need to make time at the end of each day to look over the planners for the day, make note of the successful details of each class, and also of the details that were unsuccessful. Master this portion of class planning and you will continually become better at class planning, which in turn will increase the overall success of the school. What worked well in the class? What didn’t work well in the class? What can I modify to make the next class better? What worked well in class? A simple way to identify what worked well in class is to carefully observe the students, instructors, and spectators throughout the entire class. Keep an eye out for everyone’s attention span, learning curve, and sense of enjoyment. When you notice that everyone is paying attention, everyone is picking up the curriculum, and everyone is having fun then you know that what you are doing is working. This is the easiest and most rewarding part of assessing your progress because you get to pat yourself on the back for a job well done. What didn’t work well in class? It’s easy to tell what went right in class based on the students, instructors, and spectators responses. However, it can be challenging to discover what didn’t work well because we tend to let our ego get in the way, and we don’t always have the courage to face de-motivation. With that said, you need to be patient with yourself, but at the same time firm on your goals which should be to become better and better each and every class. To do so, you must identify what didn’t work so that you can improve upon your weak areas. Once you identify both your strengths and weaknesses, then next step is to make an action plan to make the next class even better. The simple formula for this step is to simply stick with the methods that are working and replace the methods that are not working with new methods. Sounds simple, and it should be, but only after you’ve practiced mastering the first two areas of assessing your progress first. Be sure to email me at melodyshuman@skillzconnect.com for some free samples of our age-specific class planners. Class planning includes a balance of science, art, and intellect. It is an ongoing journey that takes just as much (if not more) time, training, and effort as it does to reach the level of Black Belt. The entire process is far more comprehensive than what many people think. The days of “winging it” each and every class are over, especially with this generation of Martial Arts students. If you want to have a successful career as a Martial Arts instructor it is important that you follow the lesson provided within this report carefully and diligently.